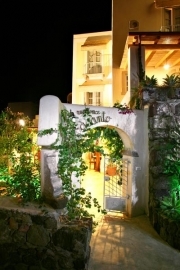 The Residence Acanto is in the centre of Lipari, the biggest island of the archipelago. It is 50 mts away from the port. All apartments have LCD satellite colour TV, air conditioning, safe, telephone, internet access, fully equipped built-in kitchenette, spacious wardrobe and bathroom with shower. A one-roomed apartment with entrance from another typical alleyway up a flight of low steps. It has a double bed and a single sofa bed, a built-in kitchenette and a big bathroom with shower (suitable for disabled people). (It is near Apartment Salvia). An apartment on the first floor with an independent entrance, a double bedroom with a balcony. It has a living room with a double sofa bed, a built-in kitchenette, a covered furnished terrace with a view, a bathroom with shower and a wardrobe. The apartment can be reached through a typical alleyway which enhances the characteristics of the place. It has a large bedroom with a double bed and a double sofa bed, a spacious and bright kitchen/living room with a double sofa bed. There is also a big window with a view, a wardrobe and a bathroom with shower and window. The apartment can be reached through a typical alleyway which enhances the characteristics of the place. It has a double bedroom and an additional double bedroom with a furnished terrace, a living room with a double sofa bed and a built-in kitchenette and a bathroom with a shower cabin. 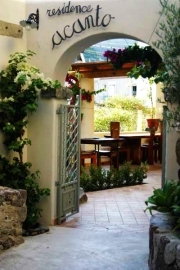 The apartment can be reached through a typical alleyway which enhances the characteristics of the place. It is a spacious one-roomed apartment with a double bed and a sofa bed. There is also a built-in kitchenette and a bathroom with shower. It has a small furnished space outside by the entrance. An apartment on the first floor with access via a staircase and with an independent covered furnished terrace. It has a large double bedroom with two balconies, a living room with a double sofa bed and a built-in kitchenette. It has a bathroom with shower. An apartment with access from another typical alleyway up a flight of low steps. It has a living room with a double sofa bed and a built-in kitchenette and a double bedroom with an additional independent entrance. It has a bathroom with shower and a small space by the entrance. It is near the apartment Nigella. The Residence Acanto places a wide terrace solarium with bar and swimming/hydromassage pool at its guests’ disposal. The Aeolian Islands can be reached from the airports of Catania, Naples, Palermo and Reggio Calabria; by hydrofoil from the ports of Naples, Messina, Milazzo, Palermo and Reggio Calabria and by boat from the ports of Naples and Milazzo. Either cauliflower or broccoli can be used for this sauce; if You use the latter You must then serve with pasta orecchiette to reproduce the classic dish from Puglia.